Eurocom is launching a unique opportunity for Alienware M15x users who can now trade in their system for 25% off any Eurocom high performance, fully upgradeable Gaming Laptops. “With some Alienware systems moving towards integrated graphics, Eurocom is a perfect alternative to those who value upgradeable, high performance MXM 3.0b graphics capability. We’ve decided to make things a bit easier if you’re ready to make the move to a high-quality, high-performance, long-term laptop solution.” Mark Bialic, Eurocom President. 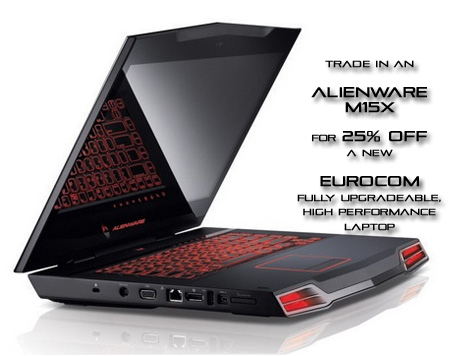 Customers can Trade In an Alienware M15x in any condition, and we’ll give you 25% off any Eurocom laptop. That’s 25% off after you’ve configured it and made it your laptop to love. This offer ends March 31, 2015. Eurocom designs High Performance Supercomputer Class Mobile systems, allowing users to experience epic performance now and into the future with simple upgrades. Eurocom integrates MXM 3.0b technology into their high performance notebooks and gaming laptops because it allows those systems to support the most powerful graphics technology on the market while allowing for possible upgrade options. “Alienware users are very tech savvy and value high quality, upgradeable products so they will value what Eurocom products have to offer, especially with the recently launched EUROCOM P5 and P7 ultra high performance, desktop processor powered laptops with NVIDIA GeForce GTX 980M graphics. Our thinnest laptops powered by Intel Core i7 desktop processors.” Mark Bialic, Eurocom President. At Eurocom, the customer is king, they can configure their system at time of purchase, customize the performance by overclocking their laptop on select systems and then by upgrading their system when they need a boost. Customers who are interested in taking advantage of this opportunity please contact Sales@eurocom.com to speak with a technology expert or browse through the Eurocom online product library to find a perfect High Performance laptop at www.eurocom.com. “We are trying to lead a Renaissance of Upgradeability to allow users the opportunity to lower the total cost of ownership by extending the life of their laptop by increasing performance and capability through component upgrades. We want customers to love their laptop, care for their laptop and upgrade their laptop” Mark Bialic, Eurocom President.